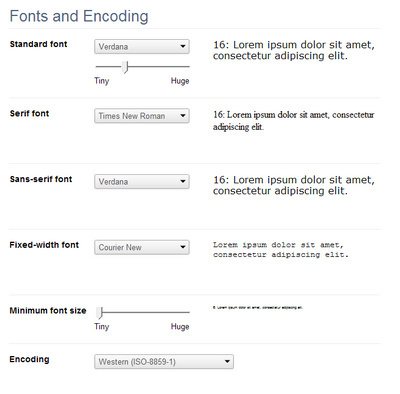 One of the most annoying things with Google Chrome can be the inability to restore the default font configuration. It happens like this… some users accidentally press down the Crtl key on their keyboard, and then nudge their mouse scroll-wheel at the same time. On many systems this causes font size to increase or decrease in the Web browser. But users don’t realise that this happens independently of the Chrome font options. So users will try to change their Chrome font options to fix the problem. These Chrome changes then lead to an almighty font-size tangle. And it’s a tangle they can’t easily back out of — because Google doesn’t include a “Restore defaults” button in the fonts panel. 2. Manually change settings back to the following default setup. The only thing I’ve changed here is the ‘Standard’ and ‘Sans-serif’ fonts to Verdana, from Times New Roman. 3. Refresh the page in the Chrome browser. Now press down Crtl and then use your mouse scroll-wheel, until the fonts look as you expect them to. Thank you, I was going crazy trying to restore default fonts.